During weeks leading up to chinese festivities in georgetown, don't be surprised to find makeshift performance stages being set up on streets and alleys - blocking access completely. Chinese operas and Puppet shows are very much alive in Penang as well as dragon and lion dances especially at temple entrances. Driving around Georgetown is complicated. The one-way street system is confusing and weekend traffic is debilitating. My travel partner likens it to a game on the pinball machine! The island itself has its own identity and pace only islanders are familiar with. Trishaws can be seen coming down the opposite way on a one-way street, totally oblivious to the obvious congestion they cause along the way. Octogenarians driving around in their little beetles and old Morgans at 30kph also oblivious to the fact that the streets have been converted to One-Way routes some time back . and motorbikes.everywhere, anarchy rules on the streets of Georgetown! The local municipal council has in fact started to include pavement walkways for tourists and shoppers alike in areas like Lebuh Acheh (Acheen Street) and Lebuh Armenian. Forget about the traffic, the confusion, the haphazardness and let yourself blend into the surroundings. Then, Georgetown will begin to open up to those willing to experience. The daily working lives of the older folk who cling on dearly to their trades that are fast disappearing due to technology and mass production. They are still there. continuing with their lives' work in dimly lit shops and in the back alleys. The following are a few still operating as their forefathers or employers have been for years. The Koay clan are are the descendants of Arabian and Middle Eastern people and were successful seafarers and traders. When they arrived in Penang having escaped from the oppressive Chinese Government in China, they settled in comfortably as they found that the many chinese immigrants in this new land were also from the Fujian province hence speaking the same language and had similar culture. The Koay immigrants found work as as traders, port coolies and boatmen. The Koay jetty is the last clan jetty to be built in Penang. 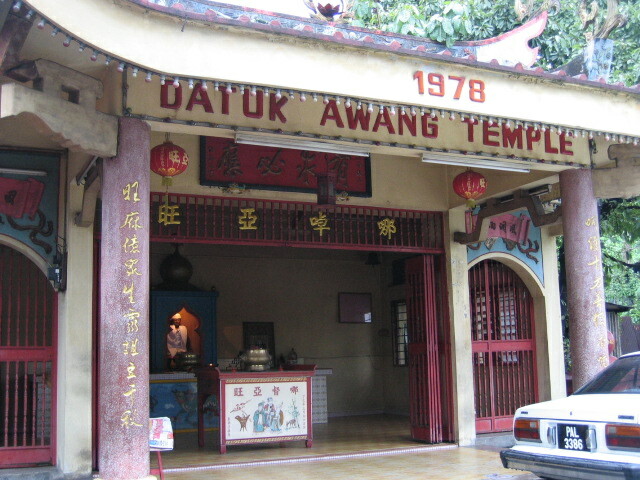 At the T- junction of Peasgrave Street, the street leading to Peng Aun jetty and Koay jetty is a small temple called the Datuk Awang Temple. It's strange to see a deity that is dressed distinctively Muslim being worshiped in a temple, where joss sticks are offered at the altar. This may have something to do with the history of the Koay clan. The 5th generation Koay descendants were faced with attacks from the Han Chinese extremists. This was due to a retaliation when it was found that a group of Hui muslims had supported the Ming dynasty government to put down a rebellion in Fujian. To protect their village and people, the Koays downplayed their Hui identity. They intermarried with Han women and allowed these women to rear pigs, so that they blended into their surroundings. In 1975, the Koay community in Penang published a notice which was to be framed and hung on the wall by every clansmen. The notice provides the generational names to be followed by the Koay clan for forty generations. The present generation of Koays can trace their geneology back to between 17-22 generations. Lau Woon Chwee, the boatmaker who had his workshop not far from the Koay jetty was known for his skills at making boats for the dragon boat races that are held every year on the fifth day of the fifth moon of the lunar calendar. The mast head of the dragon pierces through sprays of water, gnarling at competitors as the long, slender body powered by 26 able bodied men push the boat to maximum speed. The race itself has drawn a great many contestants not only from Asia but internationally. So grab your bak chang (meat dumplings) and head off to Teluk Bahang dam for some great fun. Further down from the boatmaker's is the mangrove area. Mangroves used to line the length of the beach here. Unfortunately due to development, much has been removed. The recent Tsunami that hit Penang's shores has now prompted the government to restore the mangrove swamps and to protect those existing. We hope this includes the mangrove areas along the jetty areas. (the mangrove at koay jetty is in serious need of some cleaning up though). The Chew jetty is the only jetty that actively promotes their location as tourist friendly. However, the throngs of tourists poking into their homes unannounced and being intrusive and all , has kind of taken a toll on some of them. Word of Advice - those grubby looking shacks are homes. They may not look much to us, but they are precious to the homeowners. Please be mindful. At the end of the jetty sits a temple and on the 8th night of Chinese New Year, it comes alive with prayers and incantations, fireworks and throngs of worshippers. A non-governmental organisation set up for the conservation and preservation of Penang's Architectural, Cultural and living heritage. The centre is run by volunteers, who are passionate about conserving their heritage. A number of the volunteers also conduct guided heritage walk tours, please click to Heritage Walk Georgetown for more details. We believe that development guided by respect for community, heritage and environment will improve our quality of life and prosper our local economy. Imagine the Prangin Canal area reclaimed as a people’s park and the derelict row of shophouses restored. Imagine our abandoned warehouses turned into a city campus for one of the world’s top universities. Imagine walking through car-free streetscapes and taking a tram around George Town. Imagine Penang Hill developed with care keeping its character as a historic hill station and forest reserve. Over the last 25 years, the Penang Heritage Trust has made a difference to Penang. Imagine what we can do with your support and sponsorship! Get in touch with PHT or even join their numerous talks and events, https://www.facebook.com/PenangHeritage/ , they're a helpful bunch of people. The sudden revival and emerging interest in George Town or Penang for that matter is changing it's landscape quicker than what we could have imagined in 2008. Numerous hotels and cafes/restaurants, museums, and other entertainment outlets have sprouted over a short time ...there has been a lot of interest in the old sector for its charms and its investment opportunities (or rather as trophies for the wealthy). Families who have lived and borne generations as well as old trades that have been operating for decades here have and are being removed as landlords and property owners sell their units to foreign investors or raise rentals to a level that the urban poor can no longer afford to stay.... Elsewhere on the island, environs are being torn apart and converted into multi complexes , homing the well to do and providing holiday homes to jet-setters and their clones. Penang is chasing the ever elusive dream and the authorities, in their dream of leaving a more developed and economically independent state, are now singing to the tunes of multi-conglomerates. How much can this island take? The answer should reveal itself soon, my guess.. This is a gem of a place. Restored to its original, 120 Armenian Street hold tribute to Dr. Sun Yat Sen , China's foremost founding father of Nationalistic Ideals. Dr. Sun's revolutionary ideas and ideals maintain an influence in political and socio-economic policies in some countries even to date. The Admission fee is only RM5 per person and when we visited, a Ms Goh gave us a thorough, most intriguing tour around. It turned out that Ms Goh produced a movie on Dr. Sun Yat Sen's life in Penang. All locations were filmed exclusively in Penang and the movie previewed to a very approving crowd in 2007. The movie, Road To Dawn is available in DVD at the premise itself. This is the first China produced movie to be filmed in Malaysia and was filmed in August and September 2006. The grand premier was held in the Great Hall of the People in Beijing on 28 June 2008. For more on this , go to : http://www.arecabooks.com. Oh by the way , just a little tip here for book buffs.. if you pick up a book published by areca books at 120 Armenian Street - you may get it slightly cheaper than elsewhere.. The premise itself has lots of information tacked along the length of both sides of the wall. The guided tour takes about 1/2hr to 45 minutes but visitors can roam about the ground level. To the back of the house is the kitchen which has been completely restored and shows an all equipped old fashioned kitchen worth browsing around at. 122 Armenian Street, George Town, 10200 Penang. Open daily (except Mondays) 9 am – 5 pm. For those interested in Teochew Opera and Puppet Show, a museum dedicated to chinese opera and puppet show provides an insight into the passion of a small group of artisans determined to keep this fine but dying art alive and well into the next century if possible. 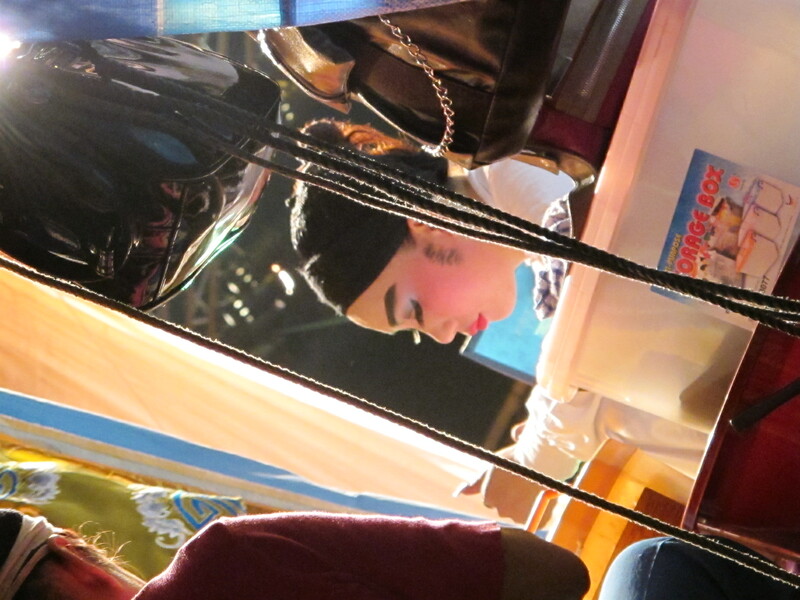 When we first got to know the Teowchew Puppet troupe, it was back in 2009 when Ling Goh and family were struggling to keep the puppet and chinese opera interest alive in Penang. Setting up their stage at temples and private functions, they found fewer people had interest in the traditional art form as time went by. But Ling Goh was relentless. Her love for the performing arts egged her to continue . Despite the odds and from the help of a handful of enthusiasts, the 'common people' like you and I are now able to learn more about the intricacies and the delicate nuances of such refined art at the Teochew Puppet and Opera Museum. 29, Church Street, 10200 Penang. Open Monday to Sunday including Public Holidays from 9:30 am to 5 pm. Admission: RM20 per person. The Peranakan Mansion sits just across the street from Penang Heritage Trust's office. The large mansion is now wedged between a row of shophouses. In 1893, not long after the prohibition of secret societies imposed by the British administration , the then Kapitan Cina - Chung Keng Kwee acquired 2 properties on Church Street. 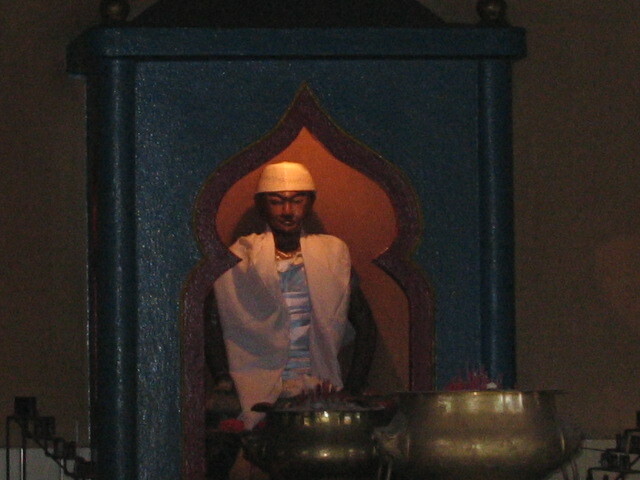 One housed the headquarters of the rival secret society called the Ghee Hin. The other was the premise of a school , Goh Hock Tung (Five Luck Villa). Keng Kwee compensated for and relocated the school to a site on Chulia Street. The Kapitan built his home and office and named it Hai Kee Chan, or Sea Rememberance Store. The chinese school was demolished and replaced with the Kapitan's ancestral temple which also served as the family school. The mansion itself reflects a hotch potch of designs, decor and structure that makes the peranakan culture unique - incorporating Chinese carved-wood panels, chinese courtyards and English floor tiles and Scottish ironworks. 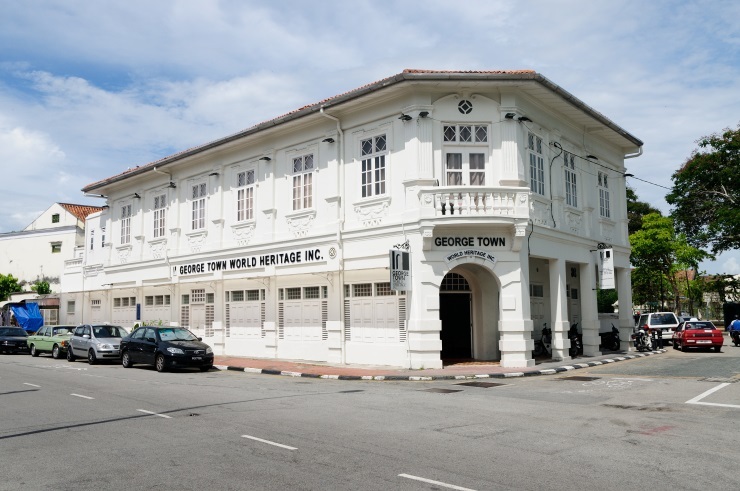 GTWHI was established by the Penang State Government in 2010 to monitor, promote and preserve the rich history of George Town. The agency itself reports directly to the Chief Minister and is responsible in bringing together a loose community of experts, advisors , concerned parties , civil servants etc in the one goal of ensuring that George Town's legacy will not be lost. For those who are interested in restoring , preserving your heritage units, GTWHI will be the best place to start. Here, visitors will be able to go through the fundamentals of restoring their units in line with the heritage department's requirements. Also , they would be good to go to , to start on your research in restoration do's and don'ts. Plus, did you know that under the SAP (Special Area Plan) there are demarcations of areas within the heritage site itself whether the unit can be converted into a commercial unit or is it strictly a residential area. Don't get yourself in a rut when considering renting, buying, converting your heritage unit - go meet with advisors and arm yourself with legit information before going into negotiations with the seller, landlord or tenant. We have seen too many people get burned due to lack of knowledge, information and contacts.